A relaxing vacation destination for families and couples, the Indian Palms Intervals resort is located in the heart of the Indio/Palm Springs/Palm Desert region. Surrounded by world-class golf courses, souvenir shopping arcades, and museums, this resort caters to those who want the perfect combination of contemporary, upscale lodgings and quick access to all that Indio and Palm Springs have to offer. Luxurious guest suites, heated outdoor pools, and a resort staff dedicated to personal service await those who choose to make this their resort destination. These Coachella Valley timeshare resales make it easy to enjoy a guest suite at discounted prices as you purchase a previously owned timeshare suite. All of the timeshare suites at Indian Palms Intervals are 700 square feet in size, contain two fully furnished bedrooms and equipped kitchen, and have both a traditional dining area plus a bar stool counter seating area. The master bedroom has a queen bed, and the second bedroom has two twin beds. 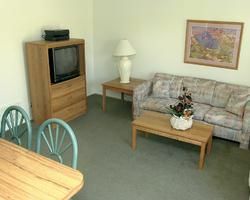 Both bedrooms have a wall-mounted flat-screen TV with full satellite television programming access. While staying at one of these suites, guests enjoy a complimentary mid-week cleaning and housekeeping service. Two outdoor pools, a full-service spa, and access to the adjacent Indian Palms Country Club are just a few of the exciting amenities and services awaiting visitors at Indian Palms Intervals. Near the pools is an expansive outdoor barbeque area, and each of these is next to the outdoor canopy-covered patios. Free Wi-Fi is available throughout the resort property. The discounted golf programs are available for all guests, with reservations made at the club's pro shop. 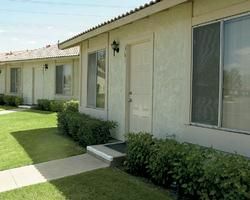 The Indian Palms Intervals resort is close to all of the major attractions in the Palm Springs region. The famous tram takes visitors high above the surrounding region, and the many museums in town offer everything from Old West exhibits to prehistoric creatures. The list of fine restaurants in Palm Springs is virtually endless, and visitors will also enjoy the guided bus tours that wind through the neighborhoods of the rich and famous. Coachella Valley timeshare resales are a great way to save on a luxurious country club suite. These units are owned by individuals, with reservations for a particular week guaranteed, so save money by buying resale here at BuyaTimeshare.com. Contact Indian Palms Intervals Specialist Today!